As you browse through our site you will soon discover, if you’ve shopped around, that Witness Box is unlike any other training provider. So what differentiates us? Most witness familiarisation trainers are lawyers and lawyers, of course, spend their time in front of the witness box having rarely given evidence, but Trevor can tell you what it is really like from the inside. In the course of his career he has undergone rigorous root-and-branch cross-examinations and is well aware of the barrister’s tricks of the trade and, more importantly, how best to deal with them and it is this experience and knowledge he will share with you. Our training will give you as close an experience as possible to what it is like to be cross-examined in a formal setting by a leading barrister who will test your evidence. Co-tutor, Stephen, has considerable experience in the cross-examination of witnesses, both lay and expert, and it is this unique combination no other training provider can deliver. Trevor and Stephen combine to provide an unbeatable perspective of the Art of Giving Evidence to ensure you give the very best evidence you possibly can. Once the course is completed it may be some time before you give evidence. 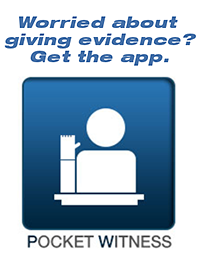 Using the latest technology, we will give you all the information you need to refresh yourself contained in our unique mobile app, Pocket Witness, which you can refer to at any time – even in the waiting area of a Court. But don’t forget to switch it off when you are called to give evidence! The app is free to all course delegates. Although there is nothing better than face-to-face tuition and the experience of cross-examination, the next best option is the amazing world-first mobile app developed by Trevor, Pocket Witness, which provides all the information you need at your fingertips. You can purchase it by visiting the link to the side of this page.